Having enjoyed a beautiful mild and bright period of weather, including a high of 18C a week or so ago, now the season is catching up on itself. A very wild night hit Scotland - the much reduced tail end of hurricane Noel brought very strong winds and snow to us here in the North East. All the beautiful colours of the autumn are now lying on the ground with very few leaves left on the trees. 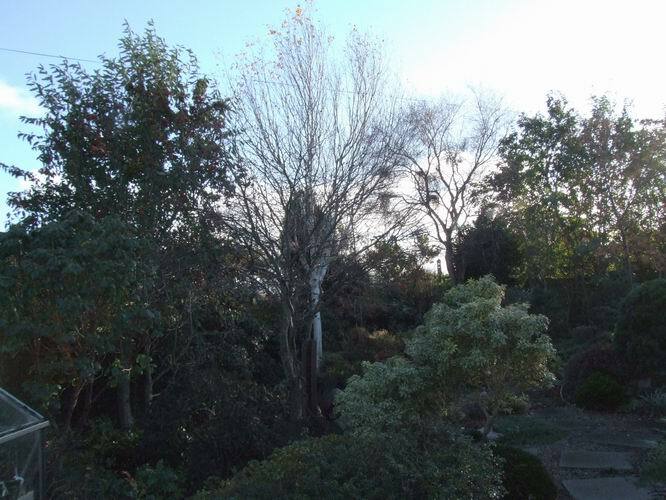 Except that is for the Cotoneaster trees which can hold onto their leaves all through the winter if the cold is not too severe - they then drop them in the spring before the new season's leaves emerge. 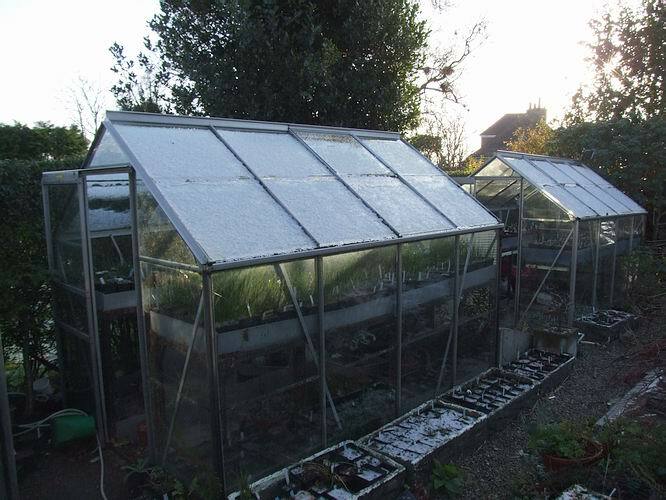 A very small layer of icy snow covers the bulb house roofs but the cooling weather will slow down the growth of the bulbs. 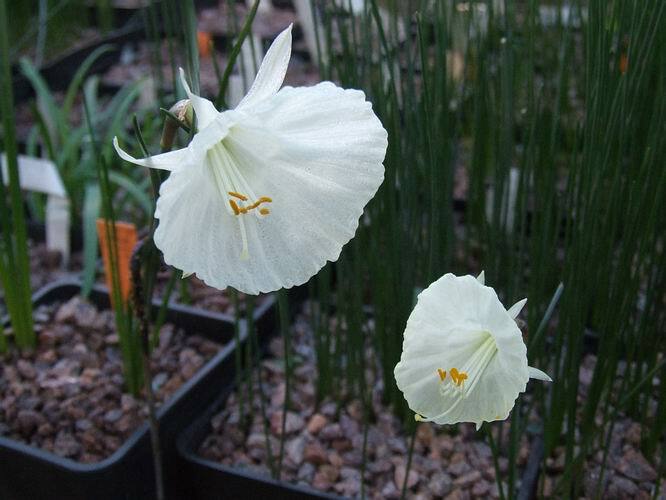 Inside a few Narcissus are now flowering and there are many more buds poking through the gravel top dressing. 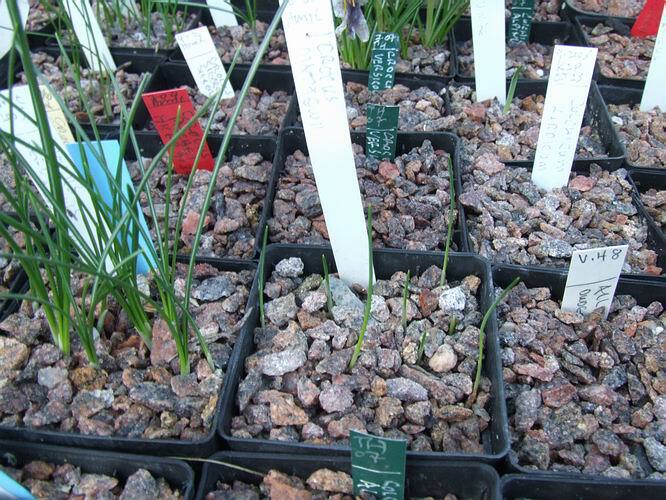 Above left is a seedling from Narcissus 'Camoro' which is a hybrid between N. cantabricus monophyllus and N. romieuxii. Taking the first two letters of each of the specific names ca, mo, and ro gives us the name 'Camoro' that Henry Taylor gave to this lovely bulb which he raised. Like many Narcissus hybrids it is fertile and the offspring, while quite similar to the parent, do show some variations. 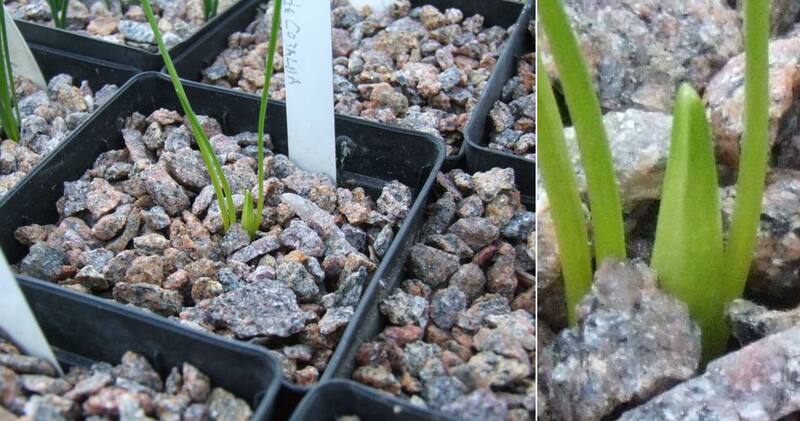 The flower on the right is one of the plunge seedling bulbs so I do not know either of its parents but from its looks and the time of flowering I believe it to be a seedling of N. romieuxii mesatlanticus. Seen in profile you can see there are more differences between the two flowers than there appears at the first glance. 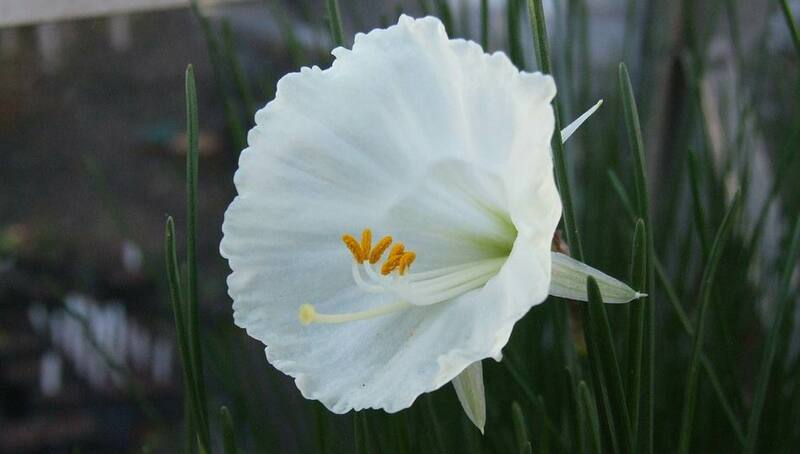 I much prefer the elegant lines and pure white of the 'Camoro' seedling. Now the temperatures have dropped the growth of the leaves will slow down so I will not need to water so often. During the recent warm spell I have been watering pots with good growth at least every week. 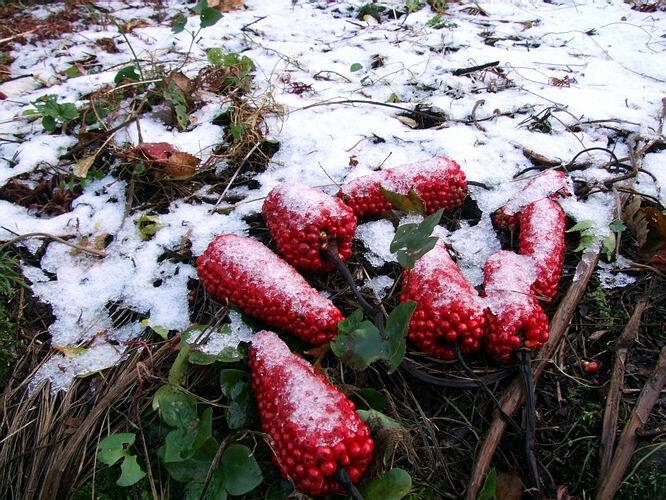 As long as the cold prevails I will just make sure that the leaves do not show any signs of wilting. If they do start to flop from lack of moisture I will water them but it could be some weeks in this cold before that occasion arises. Of course we could go back to the mild weather at any time so I am constantly checking and responding to the plants' needs. Looking around some of the other pots these Crocus mathewii seedlings are growing nicely but they will need little additional watering during these cold weather conditions. 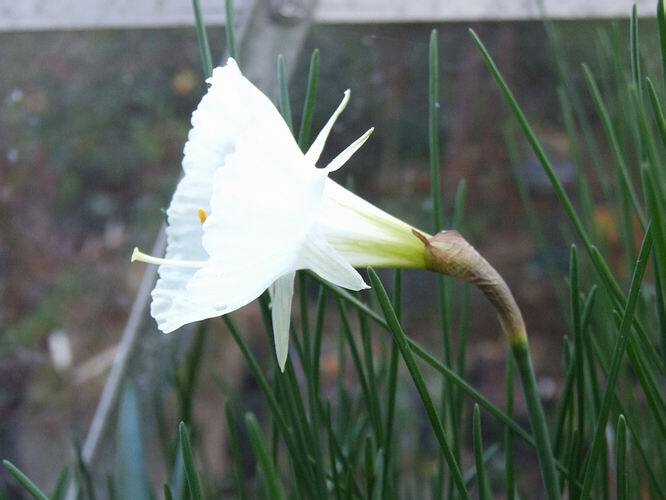 A big success for me is this lone flower bud on this Narcissus serotinus seedling. 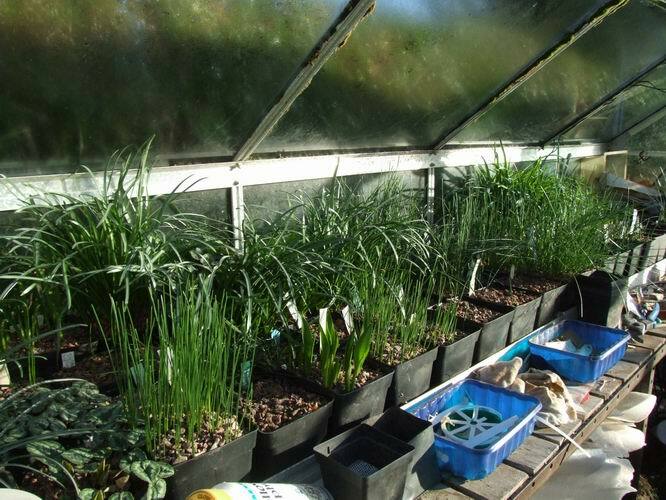 In 2004 I sowed four pots of Narcissus serotinus seeds each from a different location. I re-potted them this last summer and this pot was the poorest to date with only a single bulb in it - the others had between five and eight seedlings each. How delighted I am now to see a flower bud - I have never flowered this lovely autumnal Narcissus before but this is the first time I have raised it from seed. The few bought in bulbs I have had over the years either never flowered or were destroyed because they were virused. 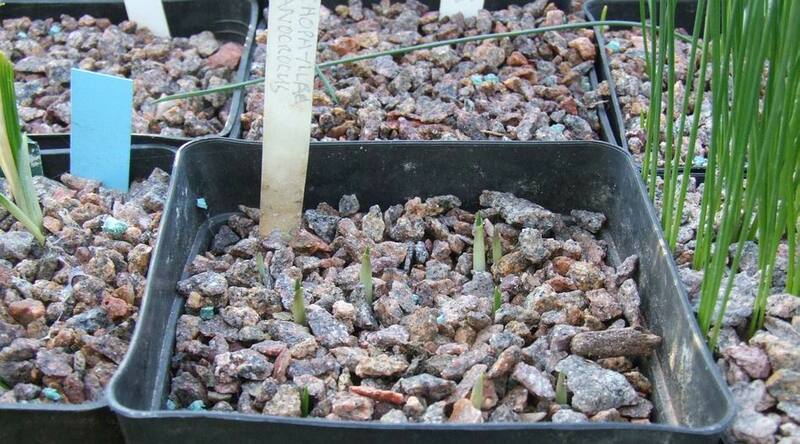 Also just appearing through the gravel are the shoots of Tecophilaea cyanocrocus. It will be March or April before they flower and I always liken the shoots appearance to sticking your big toe into the water to see if it is warm enough to tempt you to take the plunge. Obviously it is not to their liking just now so they will just wait until the average temperature is higher. On the right is a pot of Tropaeolum azureum seedlings which are just germinating. They were sown this year and left outside until they germinated - now I have moved them into the bulb house beside a pot that germinated last year. It is very important that I do not let them dry out or they will go dormant and may never wake up again. The secret is to keep them ticking over through the winter then provide them with plenty of water and supplementary feeding when it warms up in the spring. Keep them cool and shaded as the sun rises so they grow for as long as possible before they go dormant. This is a shorter edition of the bulb log this week as I am off on a mini talking tour to Ayr and Dumfries so I will end with two pictures of my favourite seedling from N. 'Camoro' to date,. It has bigger flowers than it parent with a wider corona which flares out wide then turns flat towards the edge.